Angle of descent 90 degrees. State-of-the-art electromagnetic motors blast the aerodynamic vehicles out of the station, accelerating from 0-100mph in 7 seconds before shooting straight up the 41 story tower. An unprecedented 6.5 seconds of weightlessness is experienced as riders rocket to the top, then slowly begin the terrifying backward descent. As the trains freefall straight down the skyscraper, they will once again reach the 100mph speed zone...before safely returning to earth. 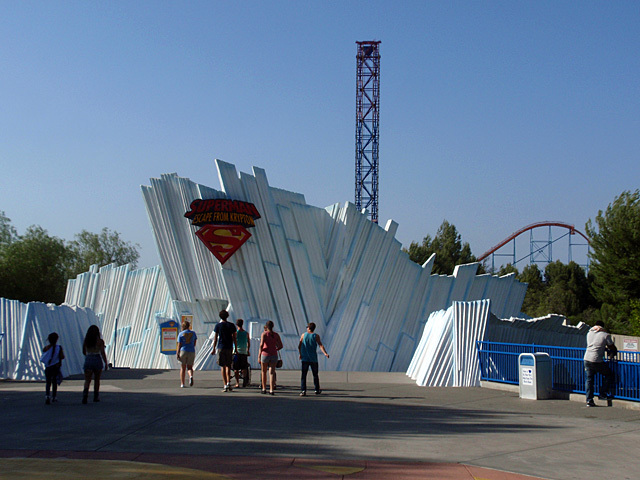 Spanning more than 900 feet across the theme park and looming 415 feet above the ground, the dual track coaster forms a gigantic 'L' shaped superstructure dramatically changing Six Flags Magic Mountain's skyline.